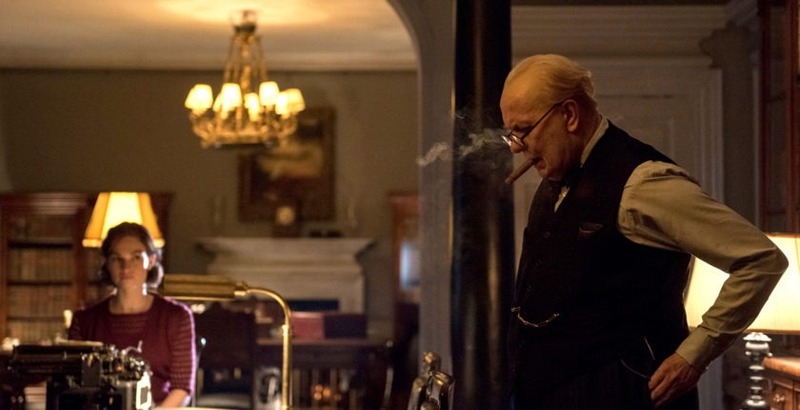 Darkest Hour, a film by Focus Features, directed by Joe Wright, script by Anthony McCarten, starring Gary Oldman as Winston Churchill, and Kristin Scott Thomas as Clementine Churchill, 2hrs 5 min, December 2017. I finally saw Darkest Hour on February 16th. The delay had not stopped me from cheekily pontificating to The Australian, weeks earlier when they asked about certain scenarios. I have no changes to make, but an important elaboration. Unexpectedly, I found the fictitious scene of Churchill in the London Underground tremendously moving. Star of the show is Gary Oldman, who deserves every accolade. Heretofore I thought Robert Hardy unmatchable as a Churchill actor. I believe now there is a tie. Robert himself was confident, before he died, that Oldman would make a superb WSC. He was right. Equal praise to the ingenious make-up artist Kazuhiro Tsuji, who came out of retirement to bring Churchill back to life. And Kirstin Scott Thomas plays an excellent Clementine. The script adds depth to the character by weaving in quips. (“All babies look like me” … “stop interrupting me when I am interrupting” … “I can boil an egg. I’ve seen it done”). The rest of the cast is fine. I feel sure Lord Halifax, “The Holy Fox,” was not the lowlife portrayed by talented Stephen Dillane. The scenes of wartime London are convincing (though by 1940 vehicles had blinkered headlights). The late Elizabeth Layton, a faithful wartime secretary, would love her portrayal by Lily James. A Minor clanger: Elizabeth was not present in May 1940. She did not join Churchill’s staff until May 1941. I feel sure she was selected because of her vivid impressions of WSC, repeated in the movie, from her book, Winston Churchill by His Personal Secretary. In Darkest Hour the action builds like a symphony. As the situation grows ever more desperate, the Prime Minister falls into lassitude (as in fact he did), thinking he may have to seek peace with “That Man.” King George VI tells him to ask the people, and take his cue accordingly. So he does—abandoning his limousine and darting into the London Underground! If Churchill had been amenable to prudence in 1931, he would have spared everyone embarrassment, but that same prudence would have dictated in 1940 negotiations with Hitler. Only the pugnacious mule of 1931 could see his way through the impossibilities of 1940. A more civilized, common-sensical soul like Halifax did negotiate with Gandhi. And, had Halifax rather than Churchill been made prime minister on 10 May 1940, he would have certainly negotiated with Hitler. Genius exacts its high price. If we like the way 1940 turned out, we have to comprehend 1931. After more than our share of historical clangers recently, Churchill admirers can welcome all this movie offers. Unlike any recent production, it genuinely honors the heroic memory. And that’s a special thing these days. Give Gary Oldman, the cast and producers a tip of the hat. To watch a video review of Darkest Hour by Hillsdale College President Larry P. Arnn, click here.